The name Zagreb comes from the shape of the area at the base of Mount Medvednica that looks like it was scooped out of the landscape. The old word for scoop is Zagrab. It was a marvelous malevolent looking sky as we arrived to Tomislava Square and the old Glavni Kolodvor train station, once a stop on the fabled Orient express from Paris to Istanbul. 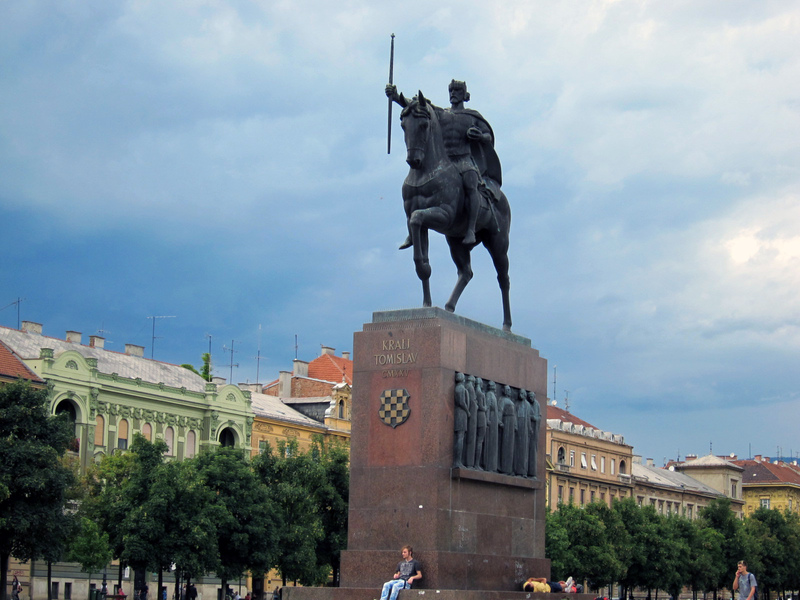 There is a great statue of King Tomislava, the first King of the Croatian Empire in the 10th century in the center of the square. Also on the square is our Hotel Esplanade, the grand Art Deco Hotel built in 1925 to entertain and pamper the passengers of the Orient Express. Its been recently renovated and restored since then and I have to say it’s one of the most beautiful hotels we’ve ever stayed at, ever. It’s also very affordable. A hotel like this in any other western city would cast 3times as much. Most of the history of Zagreb goes back to 1094 when King Ladislas I founded the 1st settlement known as Kaptol. The Mongol horde wiped out any memory of the old settlement and when the Croats signed an agreement with the Hungarians in the 13th century to rid themselves of the Mongols, they pretty much ended the Croatian Empire. The Hungarians didn’t leave for centuries. In the 16th century, the Habsburgs, who seemed to have their DNA in almost every country in Europe, married the Zagreb throne just in time to go sword to sword against the Ottoman Turks. Between the plague, the rebellions and the crumbling buildings, in 1756 the Habsburg Empress Maria Teresa moved the capital of Croatia up north a bit to the new city of Varazdin. When Varazdin burned down 20 years later in 1776 and the capital was moved back to Zagreb and the city received a great old Viennese style upgrade; tree lined boulevards, grand homes, commerce building, parks, cafes, theaters, hotels and a grand Opera. The historic Zagreb is separated into the older upper town known as Gornji Grad where the original town of Kaptol was settled in 1094 and the newer 18th and 19th century lower town called Donji Grad. The center of the old town(s) is Jelacic Square, the grand 18th century marketplace now the cultural center of the city. It’s the meeting point of theatres, cafes, trams and great people watching. In the center of the square is a statue of local hero Ban Josip Jelacic, the 19th century Viceroy of Croatia who led the 1848 revolution against Hungarian rule, abolished serfdom, promoted civil rights and fought for Croatian independence. The statue was erected in 1866, seven years after the death of Jelacic. In 1947 Marshall Josip Broz Tito removed it. After unifying all the Slavic countries into Yugoslavia, he decided the statue might instigate a new Croatian revolution for Independence. In some ways he was right. 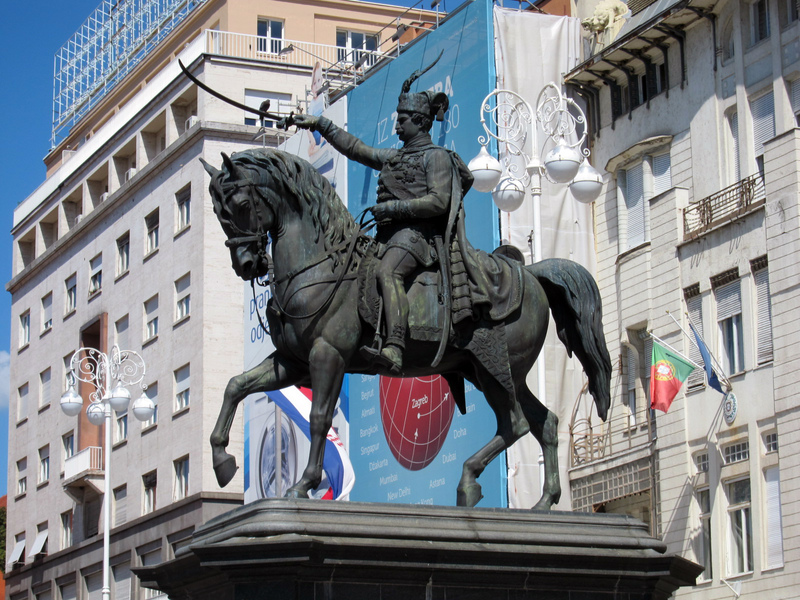 In 1991, then president Franjo Tudman, reinstalled the statue as a call for Croatian Independence from Serbia. This is a fun square to sit and watch people, trams and lucky for us the annual Zagreb International Folklore Festival. We arrived just in tome to catch Argentine dancers, Macedonian dancers, an Austrian bar singer 18th century soldiers in 18th century costumes marching in formation. The Square is big enough to stage the concerts at one end and the associated crafts market on the other. We watched some women making felt at the crafts market. Close by Jelacic Square is Dolac Square, the most famous farmer’s market in all of Croatia. Women have been operating these booths since 1930, but these days the men have gotten into the game as well. There is even a bronze statue to the women who have presided over these tables for the past 80yrs. The streets emanating from the Dolac Market are filled with cafes, small parks, bronze statues of famous Zagrebians and great people watching. On the street called Pavla Radica there is a statue actually looks a lot like Rod Blagojevich, the convicted ex Governor of Illinois. 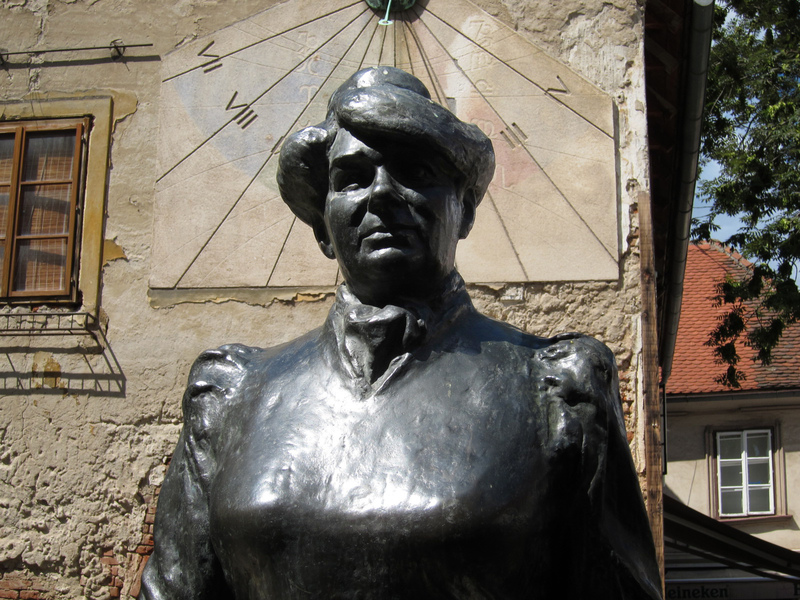 We found out later she was a writer of famous Croatian fairy tales. Kaptol , the original 1094 settlement of King Ladislas I, was named for the Christian body of Canons known as “a Capitulum”. 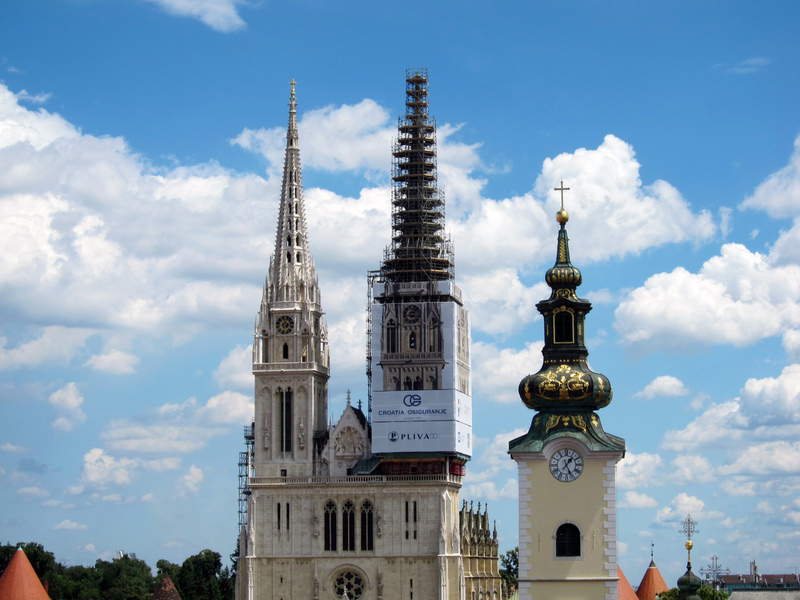 As of 1217, these laws and regulations controlled the city through the religious arm of the Zagreb Cathedral. Unfortunately this body of laws proved to be of no use in battling the Mongol invasion in 1242 when the Mongols just destroyed the church. The church was rebuilt. It was rebuilt again in 1624 after a great fire and again in 1880 after an earthquake. The two neo-classical spires are supposed to be like two eyes looking up to the heavens above. While we were there one of the eyes was undergoing reconstructive surgery. From the Cathedral we walked down a few café lined streets and then up a 250 step staircase into the heart of the old Gornji Grad,Trg Markov (St Mark’s Square), the top of the city. It was from here in 1918 when Croatia finally declared independence from Austro-Hungary. It didn’t last long. 39 years later, Croatia was swallowed up by Tito’s Yugoslavia. With the death of Tito the strains of national pride rose up again and in 1991, from the same place in St Mark’s Square, Croatia declared independence from Yugoslavia. 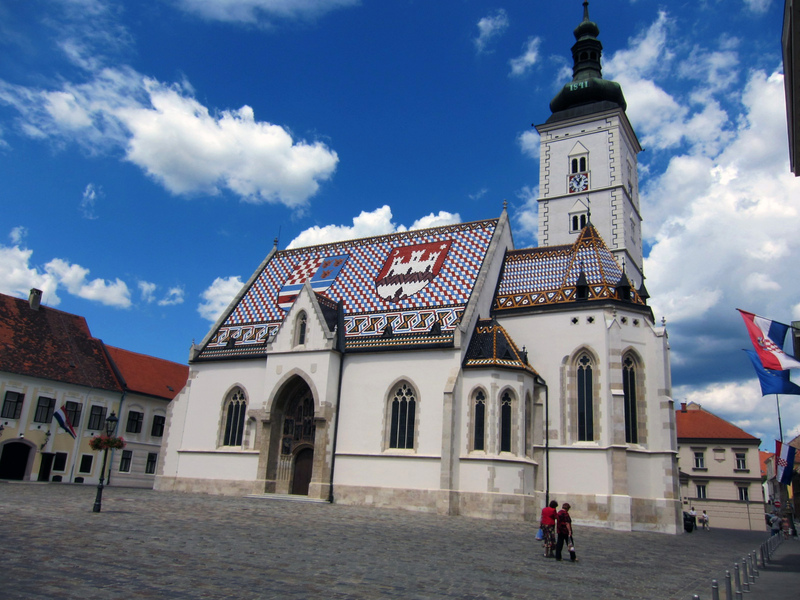 The centerpiece of the square is St Mark’s Cathedral with it’s colored ceramic roof designed with the flags of Croatia and Zagreb side by side. Down the hill from St Mark’s square is the “Stone Gate”, the only surviving relic of the old 13th century defense wall. The gate doesn’t look very old nor does it look very stone like. It’s covered with a stucco finish. What’s important about the gate is what’s inside of it, a shrine for the 16th century statue of the Holy Virgin. 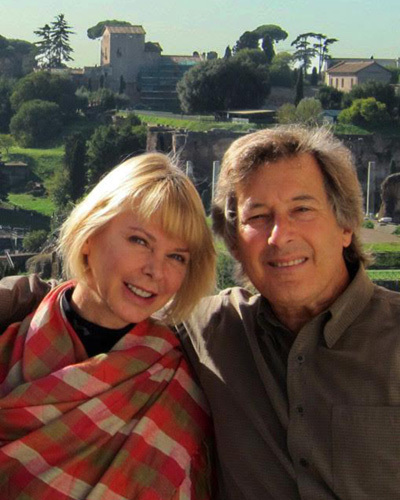 She has been working miracles from her little niche inside the arch for close to 400 years. Inside the shrine, the walls are filled with plaques reading “Hvala”, thank you. The ceiling of the arch is black with smoke residue from the thousands of candles lit for the faithful. 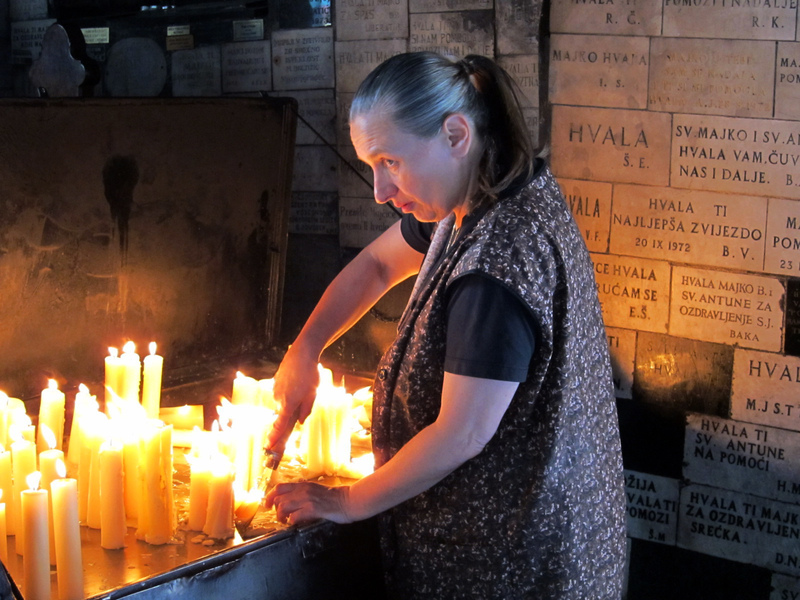 A woman tends the candles and when they are reduced to pile of molten wax, she scrapes them up and removes them to a bin, making way for more candles for sale for 1,2 and 5 kuna (5kuna =$1). Also a little walk from St Mark’s is the Lotrscak Tower was built in the 13th century. The bell on top was called the “robber’s bell” in 1646 because it rang at the end of the day when the city was about to close up, warning the residents to beware of thieves. A cannon was installed in the fourth floor of the tower on January 1, 1877 to signal noon. Originally it was a signal to the church bell ringers, but now it’s a tradition and supposedly goes off every day. We never heard it. Maybe the tradition ended or it’s on summer break. 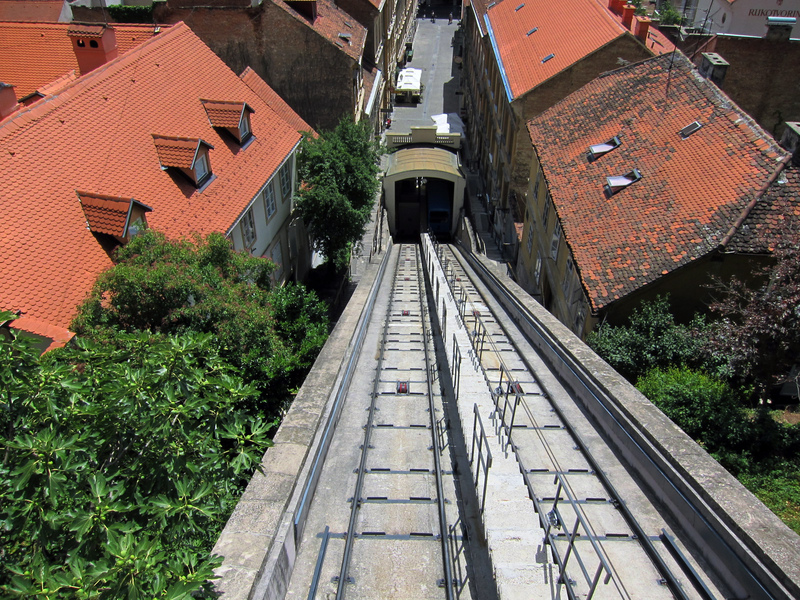 In front of the Tower is the Zet Uspinjaca Funicular that travels 66 meters (close to 218 feet) from the upper town (Gornji Grad) to the lower town (Donij Grad). It goes the other way as well. It’s got to be one of the shortest public transportations in the world. Built in 1890, the old steam engine was updated to electric in 1934 but everything else is pretty much as it was. The car has a capacity of 28 people (16 sitting down, 12 standing up). The cost was 4 kuna per person (about 80 cents) and well worth it. In Vela Luka, we found an internet restaurant review of a place we hated that read, “It was nothing to write home about, but it didn’t kill us.” For the Luxor Restaurant in Split, I can now write, it wasn’t very good and it almost killed us. And so, the second day we took it easy. The skies were cloudy and rain was in the forecast. 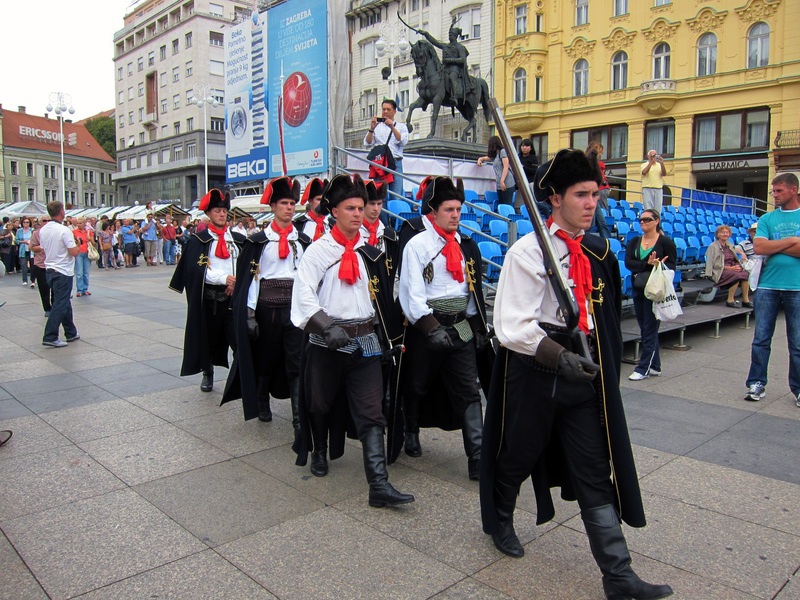 We made it up to Jelacic Square for the morning concerts of the Zagreb International Folklore Festival. We sat in a café with a great view of the costumes and when it ended we walked over to the Mimara Museum. This is the private collection of one Ante Topic Mimara, who’s remains as mysterious as his collection. Some say he was a peasant farmer’s son named Ante Topic Matutin who added Mimara (Turkish for builder) as his “nom de plume” while he was studying under an Italian portrait painter. Other stories say that he stole the name Ante Topic from a soldier who died he found on the battlefields of World War I and added the name Mimara as a reference to his own name. He was a painter, an art dealer, a restorer, possible a forger and art thief. He is sometimes referred to as the “Master Swindler of Yugoslavia”. In some stories his name even comes up as a spy. He told people the collection came from confiscated Nazi loot but he also said he was the art adviser and court painter to Hermann Goering and even painted a portrait of Hitler for Goering in 1943. He met Marshall Tito in Paris in the 1930s and probably used this introduction to get into the Allied Control Council in Germany in 1946 as an adviser to the Yugoslav military. Armed with full diplomatic immunity he was able to travel to any country without a passport and collect stolen art. In 1949 he became the advisor in Restitution Affairs for the Yugoslavian Government, which included restoring art, silver, platinum and zinc to their rightful owners. It was one of those one for you and one for me arrangements. But the greatest con of all is that Mimara sold the entire collection of 3,600 pieces to the Yugoslavian State in 1973 for an annuity of $100,00 a year plus a house in the city and another on the coast. After his death, his widow, Wiltrud Topic Mersmann was to receive an annuity of $50,000. The state thought they were getting a collection worth billions. Mimara died in January 1987. As of 2001, Wiltrud Topic Mersmann was still collecting the annuity. I have no idea if she is still alive today. There was also a son, Nikolaus Topic-Matutin. I have no idea how he plays into the inheritance. The Museum opened it’s doors in 1987, very soon after Mimara died, only to discover that many of the pieces were fakes. As we walk through the amazing collection of Goya, Bosch, Rubens, Van Dyck, Raphael, Velazquez and many others now listed as “Radionica” or painted by someone in the style of. But even with the fakes, there are still some amazing pieces. After all 3,600 pieces of art is pretty impressive. One of the galleries is a tribute to Mimara. 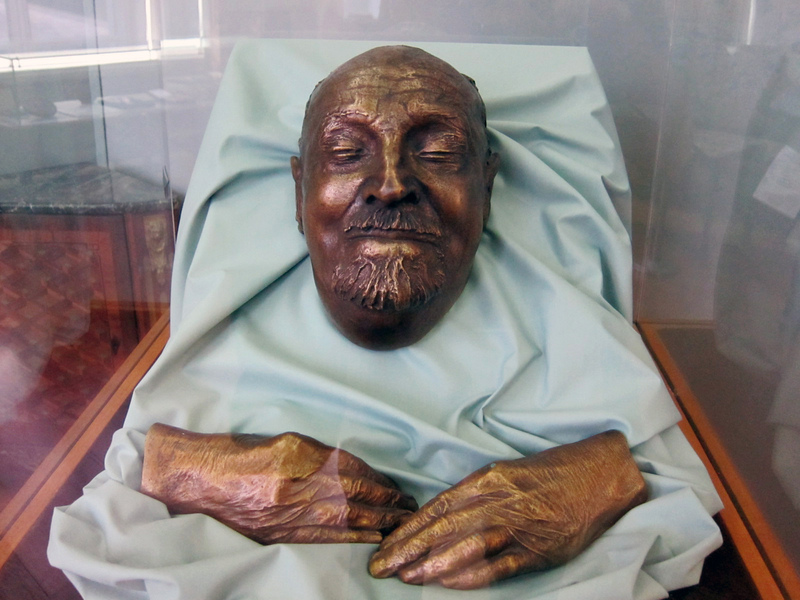 It contains his personal furniture and in a glass case in the corner of the room are bronze casts of his hands and death mask. He is smiling. Why not.